Everyone who knows me knows how I like to start my day (sometimes even end my day). I love delicious green smoothies, and for this reason I make tons of them. All different flavors, ingredients, and colors! 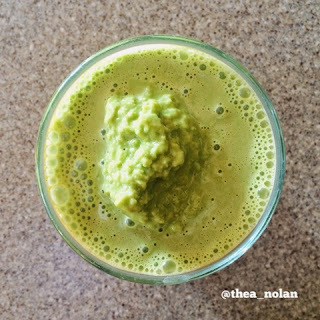 What's your favorite green smoothie recipe? Share it with me on Instagram and tag @thea_nolan for your chance to win @manitobaharvest protein. Why that brand of protein? Manitoba harvest has the only water soluble protein on the market(it blends well in a shaker cup). Some benefits of hemp protein is that Hemp70 is easily digestible, a complete plant based protein, offering all essential amino acids - great for vegan or vegetarian diets. It's also just better for you than Whey, so if you aren't vegan or vegetarian it's a great option. I love that It is mild tasting with a creamy texture that is delicious to add to my smoothies, or stirred into yogurt and oatmeal! My favorite flavor is chocolate.